Description: Two C44's speed past with a unit ethanol train. Description: taken from the Parking lot of the Saints stadium. 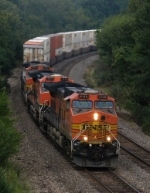 Description: BNSF westbound manifest on BNSF Mendota Sub. Description: Bob Hook, who owns the house here waves to an EB train. 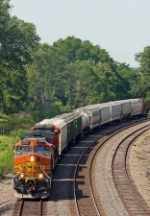 Description: A couple Boeing 737's are enjoying the ride on a BNSF Train through the Bottoms. Description: Quick, not really worth anything snap of a westbound. Description: BNSF 4917 leads this grain train that is currently tied down in Old Monroe, Mo. This train is short, only about 45 cars long. Description: Eastbound at West Carrollton on the NS Dayton District milepost CJ 215 at 1204 9/20/14. Weve seen a lot of foreign power all summer long.